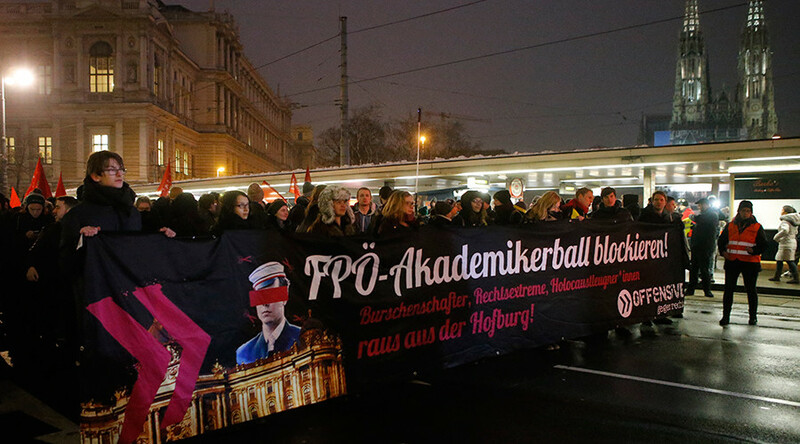 Several thousand people have joined the protests against the annual so called Academics Ball in the Austrian capital of Vienna, sponsored by the right-wing Freedom Party. Smaller that last year’s, the rally passed peacefully under the watchful eye of police. Nearly 3,000 people marched through the city center, according the police estimations, the Austrian Nachrichten reported. Some 2,700 police officers were deployed to ensure security at the rally, Heute reports. The organizers, however, say that at least 4,000 people turned up at the demonstration in the evening hour with strong support from the “Offensive against right” (OGR) antifascist movement. The year's protest drew a smaller crowd compared to last year's event when more than 5,000 people joined the protests, according to police estimates. Last year, organizers also disputed the numbers putting the figure at 8,000 demonstrators. Protesters could be seen carrying drums, flags and placards targeting the ball as well as Austria's authorities and especially Interior Minister Wolfgang Sobotka, who has called for restrictions on the right of gatherings. “Freedom Party out, refugees welcome,” read one of the posters. “Let’s fight against Freedom Party and deportations and for jobs and higher wages,” another one said. A demonstrator in a wheel-chair was seen with a poster saying “No Nazis in Hofburg,” which is a former imperial palace in the centre of Vienna where the ball traditionally takes place. “Every year, we must point out that racism, right-wing extremism, fascism, anti-semitism and intolerance are not allowed in our cosmopolitan society. We won’t get tired of repeating this,” said the message sent out ahead of the event and signed by a whole range of liberal youth organizations, including “Red Falcons” (Roten Falken) and The Socialist Youth of Germany (Sozialistische Jugend). The rally, described as a peaceful one, ended at around 7:15pm local time at Stephansplatz while the controversial ball began at 9pm. A heavy police presence was reported all along the demonstration’s route. Last year’s protest was largely peaceful as well, however, there were some disturbances. People threw eggs at the police, but no injuries or arrests were reported. The Academics Ball (Akademikerball) is held every year at the Hofburg Palace. The Freedom Party, rooting for Euroscepticism and against the so called 'open-door' policy for refugees, is known to be the sponsor of the event. The ball has, since its inception in 2013, drawn figures from several foreign right-wing parties, including Austria’s FPO, France’s National Front, and the Dutch Freedom Party.